The goal of Howdju.com is to efficiently present knowledge to all users of the internet. The presentation assumes that knowledge consists of two parts, conclusions and justifications for those conclusions. The presentation proceeds under the further assumption that the transmission of knowledge is only as strong as a user’s understanding of not only the justifications in support of a conclusion, but also those in opposition to it. To accomplish this goal, Howdju.com accepts users’ statements and justifications for believing or not believing those statements. Users provide feedback on the sufficiency of those justifications. 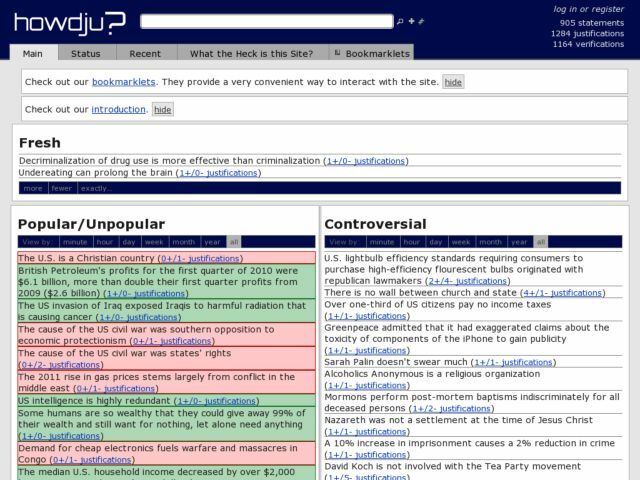 By aggregating users’ feedback, the site displays the most relevant justifications for and against a statement.